At NASA’s Ames Research Center we study the chemistry of astronomical objects within our Solar System and beyond. We use a vacuum system that was designed to reproduce the ultra low temperatures and vacuum of outer space. This is done with diffusion pumps for vacuum and a special refrigeration unit we call the “cooler”. To access parts for maintenance we must periodically lift the cooler out. 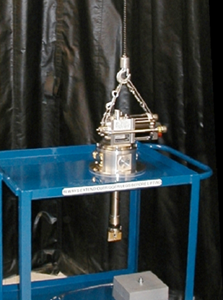 The Sky Hook Model 8570 portable lifting device is an ideal “lifting parts system” for this application. Before Sky Hook we were limited to using coolers that only weighed 15 lbs. which were lifted out by hand. It sounds easy, but not everyone could handle these smaller systems because of the attached high pressure helium lines. Obviously this method of lifting machine accessories or coolers was not ideal. Also, because using this method to lift parts was so awkward, occasionally someone would damage the sensors on the cooler. With helium hoses connected, the newest cooler weighs over 40 lbs and is even more awkward to handle. Back injury prevention is always a consideration (so it would be very impractical to lift the unit up by hand to remove). I knew we needed a portable lifting device that would allow us to lift the cooler straight up with ease, and then swing it around to the cart for maintenance. Sky Hook 8570 provided the perfect solution to all our problems. When the research scientists saw the Sky Hook 8570 in use, they all agreed that it was a fantastic lifting parts system. There was one unexpected bonus–as you can see in the close-up picture of the cooler–we are able to stop lifting at any point. Here you can see the gold-plated window holder which can easily be cleaned, then lowered back into the vacuum chamber. This alone is a big time saver AND far less awkward, because on the smaller 15lb units, the Cooler has to be completely removed and placed on a table–at the same time by hand-and at the same time deal with helium lines. Another great feature is the ability to rotate the cooler 180º, and lower it through the hole in the lift cart (where it can sit for more work that might be required).